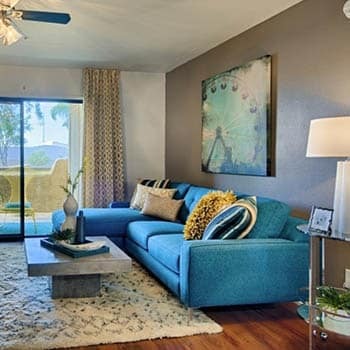 We have a full array of options for spacious one and two bedroom apartments in Scottsdale, AZ. Cabrillo Apartments offer seven distinctive floor plans designed to suit a variety of lifestyles and budgets. One bedroom layouts are sized at 530, 650, and 750 square feet. Two bedrooms measure 915, 935, 970, and 1050 square feet. Apartments have been newly renovated to reflect the sophisticated attitude of urban Scottsdale. A warm palette, plenty of natural light, and contemporary design honor the rich cultural history of the desert while embracing the modern southwest. 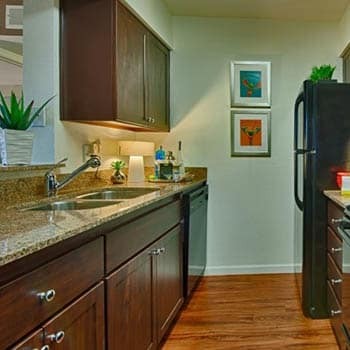 Cabrillo Apartments feature gourmet kitchens outfitted with granite countertops and stylish cabinetry. Floor plans are designed with either eat-in kitchens or dining rooms, perfect for coming together for breakfast or dinner. The private patio or balcony overlooking the lush landscape is a peaceful spot for an afternoon cup of tea or an evening glass of wine. It’s ideal, as well, for creating your own personal kitchen garden. Handsome wood-style floors, a programmable thermostat, and ceiling fans keep it cool in all apartments, no matter the mercury. In select units, you can take the chill off the desert night air with a crackling fire. Full-size kitchen appliances and an in-unit washer and dryer make short work of the daily chores, leaving you more time for the people and activities you love. At Cabrillo Apartments, the living is easy. Get in touch with our leasing office to schedule a tour of luxury one and two bedroom floor plans in Scottsdale, AZ, today.